The electrical balance (difference of the membrane’s potential) of the cells and the molecular physiological displacement of the matrix are necessary conditions for the organism’s health. The application of the condensor’s effect (CAPENERGY) on the tissues creates a current of charge movements by attraction/repulsion which intervenes in the so-called Pischinger’s basic specific tissue, where life is being born and destructed. The oscillation which is being recreated with the displacement currents has a positive effect on the alterated components of the tissues (arterial, venous and lymphatic microcirculation, matrix, cell membrane). As we will see later on, in the subjective field these kind of effects can be perceived by the clients as a thermal endogenous augmentation. While exteriorly produced warmth has proven its beneficent effects, but also its therapeutical contra-indications, the endogenous augmentation of temperature does never have collateral effects. The experience on the capacitive effect gathered in the sector through thousands of clients, confirms the physical assumptions which had already been proven previously by literature. We insist on the fact that, in spite of the applied potency, during the first minutes of the treatment, the client might not manifest any kind of sensation, let alone a muscular or nervous stimulation. In other words, the condensor effect does not involve the application of external stimulating currents, like is the case when using electro-stimulators. On the contrary, the adequate bases are being laid to stimulate the internal currents of the human body in order to recover its physiological capacity (Brown’s movements). It’s through this continuous movement of electrical charges that the information passes via the matrix and reaches the cellular receiver. The energetic effect, with release of energy towards the intra and extra cellular biological tissue with transformation of the ADP and the ATP. The thermic effect, characterized by ions stealing from one another, consecuently causing a local hyperthermia which generates an increase of the blood flow and augmentation of the demand of oxygen and nutritious substances. The treatment of the majority of pathologies, requires the application of elevated potencies during a certain period of time so the direct and reflex temperature rise provides oxygen and nutritious elements to the tissues under stress. So there is a thermal effect which varies according to the surface of the active electrode that is used and the tissue that is being treated. Beside the bio-stimulation effect, you will also see a local and reflex augmentation of the blood flow and considerable venous and lymphatic drainage. The life of each and every organism is linked to a fundamental triade, formed by: cell – matrix –capillary. Inside this triade, the role of the matrix consists of filtering all the substances in transit as well as the information which, in the shape of electromagnetical waves, passes through the matrix until arriving at the receptors of the cellular membrane. These receivers make a pratical translation of the information’s code. The matrix, considerably revaluated thanks to Pischinger’s studies, is formed by a whole of proteoglycans and glucosaminoglycans (PG and GAGs) inmersed in a watery solution of hyaluronic acid and accompanied by structural glycoproteins (collagen, elasten) and reticular glycoproteins (fibronectine, laminine and others). In the matrix cellular elements are inmersed such as fibroblasts, mastocytes, immunitary cells, the free and corpuscular terminations, the lymphatic vessels and the axons. From a cellular point of vue, the matrix is limited by a basal membrane provided with ultramiscroscopical fissures through which the information can access the cell’s interior after being capturated by the glycocalices. The level of density of the matrix (gel only) and the very high structural variability of the carbohydrates transforms the polymeres of the sugar into highly efficient informative supports. It is exactly this extreme variability that allows the matrix to maintain its homeostasy before the action of external and internal agents of any kind (short term memory). Because of this main function, the matrix also obtains the name of Basic Regulation System or Transit Section, referring to the passage through the matrix of all the information necessary for a correct cellular working. The existence on the surface of the cells of a glucidic layer, negatively charged and anchored to the proteic and lypidic portion of the membrane is of a vital importance if we want to understand the existing relations betweens cells and matrixs. 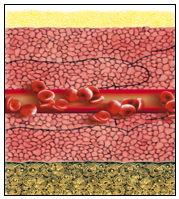 This layer is specific for each organ or each cell: the glycocalix. At the other hand this is the only receiver the cell disposes of at membrane level, so that everything that passes through the transit section inevitably gets captured by the glycocalix. The functionning of the basic regulation system is determined by a series of cytoquines, as well as neurotransmitters, neuropeptydes and hormones which determine the exchange of the PG/GAGs in function of the metabolic necessities. The interaction of all these substances regulates the functioning of the molecular filter of the transit sector. 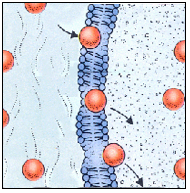 According to the quality and the quantity of the matrix’s components (protease, antiprotease, pH, concentration of electrolytes), the molecules can pass through or get blocked or refused in function of their volume and their electrical charge. The noticeable deformation of the matrix explains us the working of the device. The ground substance reacts to the mechanical stimulation of whatever nature, absorbing the energy and transforming into a viso-elastic system. When the external stimulation comes to an end, the mechanical distorsion tends to return immediately though partially to the initial conditions. The residual portion of the modification which is determined by the stimulation, gets eliminated a lot more slower which creates a cycle. This cycle of hysteresis can be identified by a sketch where the domain represents the deformability of the matrix itself. The current induced by Capenergy causes a noticeable variation on the hysterisis cycle of the matrix. This change is produced because of the inertia generated by the vibrations of the molecular reticule. The devices provokes ionisations and the atoms that are freed slip off one another and transfer the movement from one to another, thusly generating a series of acoustical waves (phonons). Part of the energy necessary for the displacement transforms into vibration energy and, consequently, into warmth. It is exactly this warmth, generated in an endothermal way, which informs the client when average or high frequencies are being used. Furthermore, as is the case for other treatments types using radio frequency, the transmission of the Capenergy current converts into one of those informative languages that circulate along the matrix. The natural electrical impulses circulate through the nervous paths and arrive at the synapsis where they access to the muscular fibre with the help of the adequate e neurotransmitter. In reality, the neurotransmittors itself are capable of producing a ground substance and, consequently, they can influence the information flow. The device can influence the basal tone of the capillar bed in which the smooth muscle generally emits potential actions of frequency modulation. These actions determine the relaxation of the neurotransmitters produced by the final axons of the sympathic if there is a cyclic synthesis of the ATP from the ADP on with a rhythmic cycle in keeping with the muscular contraction. With the same rhythm, an afflux of nutritious substances can be obtained, in the first place of the matrix and afterwards of the cell’s interior. The radio frequency that Capenergy provides is able to induce an electro-chemical polarisation of the tissues. When a source of inflammation is detected in which exist destructured tissue material, a catabolic energy release takes places that can be filled in in the form of electro-chemical potential at the level of the surrounding tissues. The use of the device makes it possible to repolarise the damaged tissue by supplying the metabolic support necessary for the arterial, venous and lymphatic flow. The most interesting factor is the fact that the necessary energy is provided directly by the tissue in question. The difference in potential registred between the hypoxic ill tissue and the well oxygenated and healthy tissue can be compared to the difference registred in a battery. In the same way, the blood vessels can be compared to isolated conductor cables at the capillar level, which at their turn unite the healthy and the ill tissue. Through the transport of the material and the conduction of the electricity in the tie junctions of the endoletial cells, there exists a connection with the ground substance. Thusly a thruly “biological battery” is born. The same phenomon takes place in the leucostatis, where the leucocites with a negative electrical surface charge assemble around a tissue with a positive electrical charge. 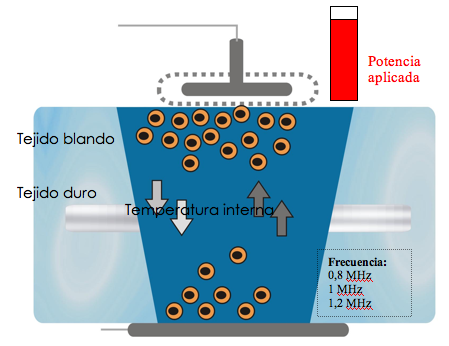 Through the Capacitive Regenerator, the local bio-chemical reactions can be modified, establishing an electro-chemical gradient which has been externely induced. 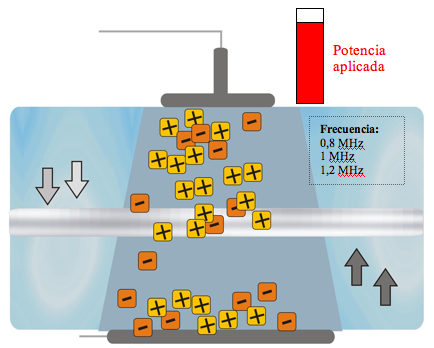 It is important to mention the conductor effect produced by Capenergy. This effect is particularly visible in cases where chemical molecules with a molecular weight inferior to 40.000 Dalton are being used on a hydrosoluble base. Conclusion: after all that has been said, it seems evident that the Capenergy treatment, when working on the specific base tissue, constitutes a method with different clinical indications. Because of all this we can say that, in the world of today, CAPENERGY is the most complete and inocuous instrument for the recuperation of the tissue’s anarchy. As you will see on your journey through this user’s manual, the only problems that can occur when applying CAPENERGY are the sole consequence of the operator’s negligence when applying or manipulating the plates and the electrodes. This is why we will give you the – clinical – application modalities, which will be explained in detail in the user’s manual, in order to guarantee the functioning of the device. It is evident that it is important to select the adequate potencies for each different pathology. The operators reffered to in the above description, can be different actors of the medical sector, such as nurses or other specialists whom, nevertheless, should always submit their work to a medical control. The device does not present any risks: it is just that it is important to assure the effectiveness of the treatments.